Hello all! With yet another Holy Week behind me, I now am focusing my efforts on performing a new set of works by the talented composer and pianist Dr. Timothy Melbinger. 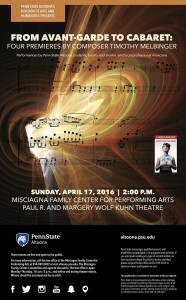 I am a mezzo-soprano soloist in his new set of works premiering on April 17th at 2 pm at Penn State Altoona. I invite you to join me for the performance of these works! Click here for more information. Miscellaneous updates: I added “He was despised” to completed repertoire and began adding performance dates to completed repertoire. Check that out if you are so inclined and I updated performance dates. – My voice teacher has arranged a coaching session for me this week with her voice coach. I’ll be coaching with a collaborative pianist/opera coach from Julliard on Friday! I’ll be singing Faites-luis mes aveux by Gounod and Sommermued by Schoenberg. This will be my second coaching session with her within the past year, she’s such a fantastic coach. – If I survive studying for my German test, I’ll be writing a creative non-fiction story about the untimely demise of my great great grandparents to submit to Hard Freight! It’s a bit more inspiring than you think. I need to have it done by the 17th, and I haven’t started it yet… However, I trust my writing abilities to have it done over the weekend. This day will be slightly busy but not as bad as last week. I have to not get distracted working my lower range now that my voice teacher taught me the vowel brightening trick… I constantly want to sing along with Karen Carpenter now.